After more than ten years of work, budgeting, living below our means, and making sacrifices like driving a car with no air conditioning in the Ohio summer it has finally happened. WE’RE DEBT FREE!!! This is including the mortgage! We paid off roughly $143,000 in mortgage debt plus $21,000 (give or take a few hundred) in credit card debt and student loans since we took control of our finances after taking a Financial Peace University class from Dave Ramsey. 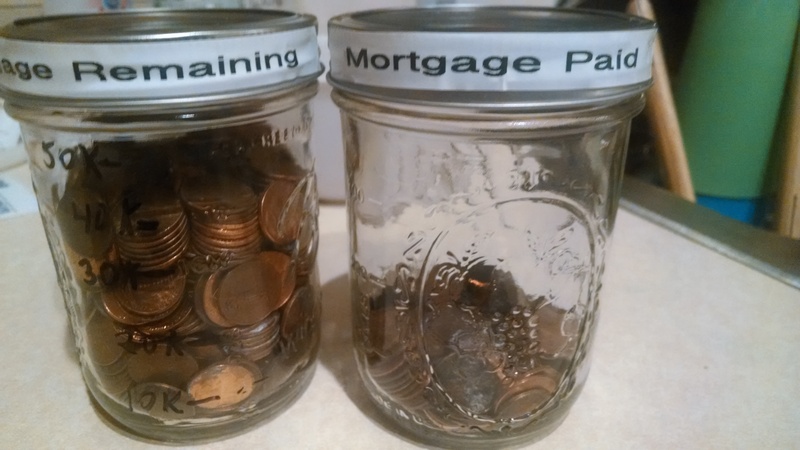 A couple years ago we decide to track the last leg of this financial journey out of debt using a jar of pennies where each penny represented $100 balance in our mortgage. Started using the You Need A Budget (YNAB) software and system. Basically Dave’s zero-based budget but living on last month’s income rather than this month’s. Living way below our means. Having goals and enjoying the ride. Big beefy emergency fund for several bumps in the road including four job losses, hitting a deer, medical issues, and the medical expenses of having two kids. We decided to get Gazelle Intense once we realized we could be 100% debt-free in 3 years if we put the pedal to the metal. Earlier this year, a friend of mine posted a fantastic idea on Facebook. Her husband was deployed in active duty to the military and she was having problems explaining to her kid when daddy was going to be back home. I’ll give you a moment to grab a tissue while you take that in…. The idea she came up with – grab two jars, and fill one with little plastic army men. One per day until her husband came home. Every day, they move one plastic green soldier from one jar to the other. When the first jar is empty, and the previously empty jar is full – it’s time for the family to be together again! This got me thinking – you could use the same idea to track almost anything! Just get two jars, fill one up and move things as you make progress. Early this year, we got our mortgage under $60,000. I found out after buying two mason jars that the jars are just about the right size for 600 pennies. 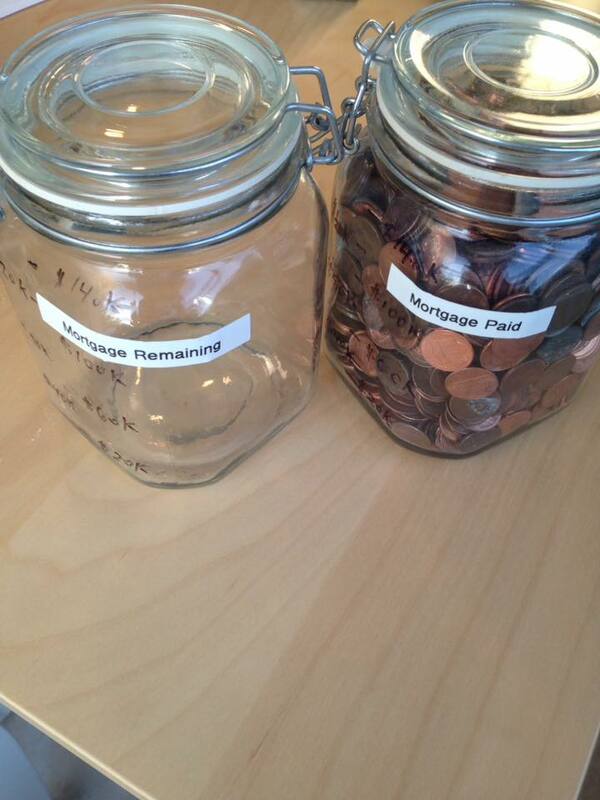 So each penny represents $100 of our mortgage. 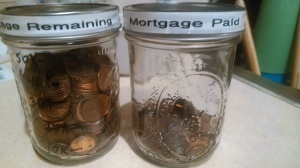 Here is what it looked like when we started using the jars for tracking our goals. I’ve decided to participate in Jon Acuff’s 2014 Empty Shelf Challenge. The idea is simple. 1. Clear out a bookshelf. 2. Every time you read a book, put it on this shelf. 3. Track your progress by posting pictures of the shelf. 4. The goal is to fill up the shelf with books you read in 2014. So far, the books I’m reading are all in digital format, so trying to figure out a way to do this. I’ll likely just print out labels and put them on books I already own that are about the same dimensions as the non-digital versions of these books.